Curving walls and towering domes can produce great architectural effects. But in some cases, their acoustic qualities are even more impressive. A whispering gallery takes advantage of the properties of certain curved spaces to offer a unique sound experience. To know if you’ve found one, stand facing a sloping surface while a friend does the same several yards away. When you whisper into the wall, your partner should hear your voice as clearly as if you were standing next to them. This seemingly magical phenomenon can be explained by whispering gallery waves. When whispers hit the circular or semicircular surface of the gallery, those vibrations cling to the surface and “creep” along the gently curving path. The slight angle of the structure keeps sound waves from dispersing out to either side. When the message reaches its intended listener, it’ll have barely diminished during the journey. Whispering galleries can be found in some of the most iconic landmarks on Earth. Here are seven enchanting examples. 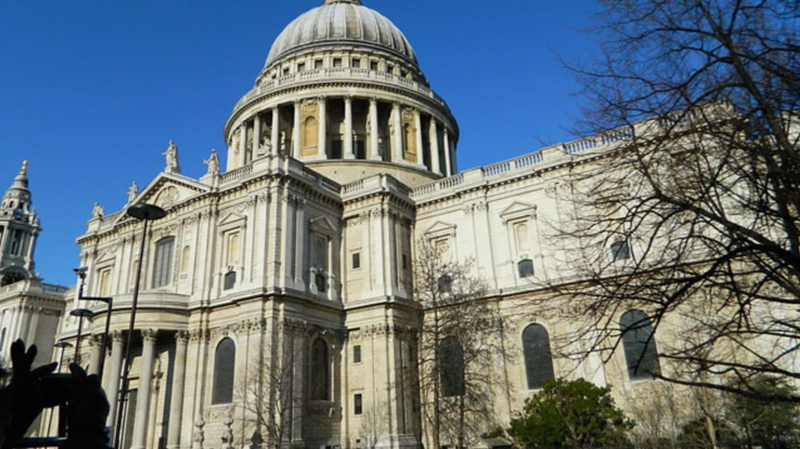 St. Paul’s in London is home to perhaps the most famous whispering gallery, a circular walkway perched 257 steps above the floor and around the perimeter of the cathedral's famous dome. At nearly 100 feet up, the balcony is not for the faint of heart, but if you’re not ready for a trek yourself, you can send your whispers for a spin. Although architect Sir Christopher Wren didn't design the balcony for its acoustic properties, they've since become well-known: In the late 1870s, the British physicist Lord Rayleigh used it as the setting for groundbreaking research on acoustics. He was the first person to propose the existence of “whispering gallery waves” that travel along a curvilinear path. Today visitors to the cathedral can recreate Lord Rayleigh’s experiment as it was done 140 years ago. Vijayapura, India is home to the 17th century Gol Gumbaz Mausoleum, final resting place of Sultan Mohammed Adil Shah. Its name literally means “circular dome,” and the distinctive topper forms one of India’s most famous whispering galleries. Visitors walking along the balcony that rings the dome’s edge can have the chance to test it out. As is the case at St. Paul’s, sound vibrations hug the walls of the walkway while the dome curling above keeps wayward sound waves contained. A whisper originating at one point can be heard on the opposite side of the 44-foot wide space. At most spots in Grand Central Terminal, maintaining a conversation with someone standing 30 feet away during rush hour is an impossible task. There’s one place where that doesn't apply. The herringbone-tiled roof arching outside the Grand Central Oyster Bar creates a whispering gallery in the middle of Manhattan. Rather than transmitting the whispers horizontally, sounds waves shoot up one of the four corners, along the arched surface of the ceiling, and back down the pillar on the opposite side. Travelers passing through Grand Central will know they’ve found the right spot when they see what looks like tourists talking to themselves in the corners. Not all whispering galleries are located beneath domes. Sometimes the back of a semi-circular bench will do. After this granite bench was constructed in a park in Spain around 1916, it didn’t take long for couples to catch on to its unique sound effects. Word of the location spread among young singles, and it soon became a popular meeting place for unmarried couples looking for privacy. In a time when the courting process was strictly monitored for indecent behaviors (i.e. touching, or even speaking), the Lovers Bench, or the Bench of Whispers, was the perfect solution. From afar, two people sitting on opposite ends can appear to be minding their own business, when in reality they’re exchanging illicit whispers of affection. Erected in the 15th century, the Temple of Heaven long served as a setting for prayer ceremonies asking for good harvests. Today the UNESCO World Heritage Site is a popular Beijing tourist destination. The Imperial Vault of Heaven, located south of the Temple’s main structure, is surrounded by a smooth, round wall—known as the Echo Wall—that’s heard half a millennium's worth of whispers. To get the full experience, visitors should plan to arrive early to avoid being drowned out by crowds of tourists with the same idea. The whispering gallery in Görlitz, Germany is easy to miss. Instead of an ancient church or mausoleum, it’s located in the entryway of a regular building in the town's Lower Market area. The channeled stone arch above the doorway at house No. 22 carries sound waves from one end to the other. The Flüsterbogen, or “Whispering Arch,” as it's known, is one of many charming attractions in the medieval German town. 7. THE U.S. CAPITOL BUILDING // WASHINGTON D.C. The dome of the U.S. Capitol building is more than a distinctive silhouette against the Washington D.C. skyline. When it was first constructed, the structure helped amplify the voices of members of Congress, long before microphones appeared on the scene. According to one urban legend, John Quincy Adams pretended to be asleep at his desk while listening to echoes of his opponents’ conversations happening in different parts of the room. This so-called “whisper spot," now part of he National Statuary Hall, is now designated by an official plaque on the floor marking the location where the former president sat during his time in Congress. According to the Architect of the Capitol, the whispering gallery effect can still be heard in sections of the hall, but the building’s acoustic properties are less pronounced than they were prior to its renovation at the turn of the 20th century.